Bangkok (Thailand) – December 22, 2017 (travelindex.com) – With their latest acquisition, Montara Hospitality Group, owners and managers of luxury resort Trisara Phuket, continue to expand the range of services and experiences linked to the history, culture, traditions and way of life of the Thais. 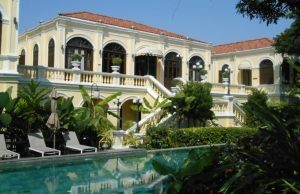 Situated on the Chao Phraya River, Praya Palazzo, which the group recently acquired, offers guests the opportunity to enjoy a traditional style that only this boutique hotel can offer. After all, how many boutique hotels can claim history, elegance and river serenity all in the heart of Bangkok? Constructed nearly 100 years ago as a private mansion in the reign of His Majesty King Vajiravudh (Rama VI), Praya Palazzo shows the graceful Thai-Italian style so popular then. Now, under the aegis of Montara Hospitality Group, Praya Palazzo, an elegant, 17-room boutique hotel, opened since 2012, providing personalized services to discerning tourists seeking a unique experience in the gentle traditions of a bygone era, will undergo extensive renovations from June 2018 onwards with a new General Manager coming on board to oversee the “facelift” of this historical landmark on the banks of the River of Kings. “The renovations will be aimed at ensuring that every detail in Praya Palazzo is carefully restored to meet our guests’ needs and interest in the Thai culture and history,” said Mr. Kittisak Pattamasaevi, Montara Hospitality Group’s Chief Commercial Officer. Rooms which are all air-conditioned and furnished with hand-made antique fittings designed for comfort and relaxation, will be upgraded. Every room offers free Wi-Fi, a flat-screen TV, and DVD player. The attached bathroom includes premium spa toiletries. Within the hotel are a library, where guests can enjoy afternoon tea while perusing books on Thai culture and history, an art gallery, as well as a 15-meter riverside outdoor pool lined with sun loungers. Praya Dining, providing indoor or outside dining by the riverside, offers Royal Thai cuisine available nowhere else in Bangkok. The dishes are prepared from recipes dating back to the days of King Rama V and King Rama VI, when ladies of the royal palaces would devote themselves to creating this ‘heritage’ cuisine fit for the king. Praya Palazzo offers another intangible element to the visitors’ Thai experience – the personal attention staff pay to each guest. In particular, Praya Palazzo is accessible only by water, with its own private traditional shuttle boats available to guests on a 24- hour basis. Whether the guest is departing for Suvarnabhumi International Airport (28 km away) or wishes to visit the nearby Grand Palace, Temple of the Emerald Buddha, Chinatown or Khao San Road, the staff are happy to make the boats available on a 24- hour basis. “Since our Group is a wholly Thai-owned and operated business, we hope to continue to seek heritage buildings and restore them to serve modern-day guests who are interested in the history, culture and the traditional way of life of the Thais, and last but not least the Thai hospitality,” said Mr. Kittisak.